Concrete stain is a fast, simple way to turn your dull gray patio into a lively, colorful surface that will make your outdoor space more inviting. The stain is nearly foolproof to apply—just wet the concrete and spray on the stain. If you’re not happy with the result, you can go back and apply a second or third coat to enhance the color. In this story, we’ll show you how to apply the stain, including ideas for mixing stains to create a unique, multicolored surface that looks like marble. You’ll save a substantial amount of money by doing it yourself, and you won’t need any special tools—just basic painting tools and rain-free weather. If you’re cutting kerfs into the concrete, you’ll need a diamond masonry blade for your circular saw. You can apply the stain over worn concrete, but don’t expect a miracle. You’ll still be able to see the old appearance through the stain. And avoid staining spalling concrete. The stain will turn a darker color wherever the concrete is pitted. 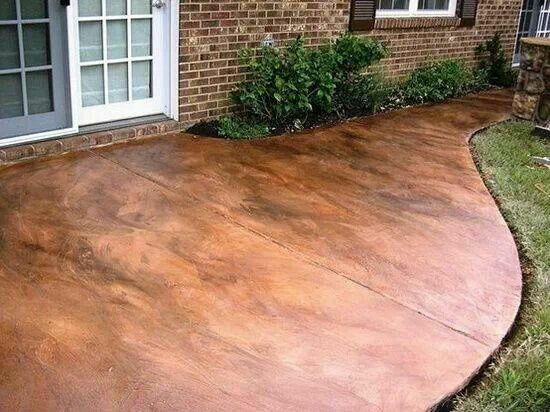 Concrete stain is a water-based product that coats the concrete and becomes a permanent part of the surface. The stains can fade and wear over time, but sealer helps protect them. Concrete stains are different from acid (or etching) stains, which chemically react with minerals in the concrete to change the color. Acid stains are available for DIYers, but there are fewer colors to choose from, and applying it involves more steps.